Whattaya mean no free samples? I'm not understanding. Peanut butter complected and evenly so. Hi! My name is Kap, you might know me from the popular internet site, YouTube. Thanks for reading my write-up of this Camacho Criollo offering. Green spot speck up by cap end of 3/3. Some trace scant Nutella hue'd marbling. A tick down along the heavier veins due to undertone of goldenrod poking further high. Cap is nicely affixed in trips form. Foot tobacco peeks out in a mainly mousy brown sort of way. Some teeny brunette. I could go for a teeny brunette, gentlepersons. Density of packing shows by eyeballing a medium. Veins, verily, but mostly not worrisome toward impending burn. Good bit of spider web varietals as well. Seams run tight to -tight. Lightest of sheen over-top. Hand-feel is some outta balance but forgivably so in a Toro format. Much weightier in the 3/3. Not certain there's 'nuff heft here, over all. Texture is paper bag with a hint of tooth and pomade. A thin looking vein that runs the entire first half and is quite the sharp ridge. Dries instead of oils on the fumbling. Charmin squeeze test indicates a barely medium density sans the liveliest spring-back yer likely to see. Read: spongy. Lettuce schnozz, shall we? Earthy cocoa shaft with some sweet graham. At the foot, some sorta dusty spice rack is added. I cut with a cutter. A Xikar Xi2 cutter. My review cutter. It cuts. Actually, CUTS. Cold pull is an open -medium resistance. Notes are close-together chocolate/honey; then ginger/bread, leather, and some spice rack. I'm sensing my typical recent Camacho experience. Interesting flavor notes delivered via sub-par means. We shall see. I thunk the thing against my wedding ring and neither sound hollow. Good. Toasting the foot is quick quick quick. Aroma of leather, spice rack, and some sweet nuttiness. First draw is an earthy thing with some dust sprinkled about. White pepper front. Lots of honey. Spices and leathers. Chocolate and honey come together in a medium legged finish. Second hottie is retro-haled to a zetz of white pepper, coarsely ground. Thick note of honey on palate. Leather under-belly. Earth driven. Chocolate primary. Short sentences. They grab attention. Third hottie is samesies, sis. Burn is ribboning on a slight waver but not so egregiously and correcting fastly on its own. Line is -medium. Ash is pale grey with many a silver sliver. As I look at it, it clumps on my Chromebook. <1/2" of quite loose powder. Palate is getting some stronger spices insofar as mouth-feel more so than notes. Notes themselves include a muscling-in graham sidling up to the honey. Draw is smooth and consistent. Combustion features a fast-paced but even burn. Packing is a tick softened at least an inch ahead of char. Room-note is a sweet earthiness driven tobacco. White pepper amps up, particularly on the RH and is more dusty, as well. Some bit of a floral note attaches at end of draw. White pepper seems to have forced up spices to the primary alongside and beyond chocolate. Honey is close under chocolate in the middlings, graham is under that. Rest of middlings is an earthiness that drives the profile. Ash is same complexion as was prior and ever, now in a tighter ladder-rung way. A tick of top-leaf lags and I pre-emptively, somewhat, re-touch. It's lagged once already, and had caught up on its own and quicker. Not too much happening throughout the opening act. My wife's chihuahua got out and we chased her down; so there was that. Ash keeps dumping around the half-inch mark. 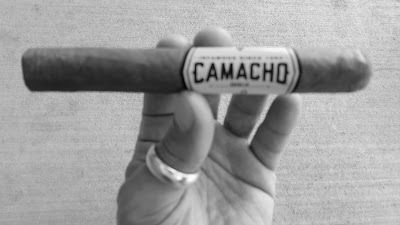 I'm schmatta-ing like there's no tomorrow with this Camacho offering. Nothing new, addition-wise. Subtraction-wise, the chocolate has fallen far back and down. Spices and earth peaking up from middling, are the primary. Middlings are spice, white pepper, honey, and that earth. Under-belly is leather with a floral vibe. Finish sees the vibe go to note and met with spices and, yes, earth. Honey suddenly soars, now. Profile has been a medium throughout. Not a lick a' strength as of yet. Room-not is the same but creamier and kinder. Softening of pack has ceased but not re-firmed. Joining in on the retro-hale is a slight citrus leaning. Toward the end of the mid-act, chocolate returns to upper middling notes, but in a more cocoa fashion. LATE TRANSITION ALERT: Creaminess comes in on draw and extends straight through to finish, then extends that. A coffee and cream, too. Leather backing rises. Earth is still everywhere, but a bit more nuanced, if not complex, on the backs of the new adds. Some light caramelized sugar flows in, as well. Burn was behaving well for a bit, now as the final act looms nigh, it's a bit wonky but noticeably and quite so, slowed. I'm still not excited by this Criollo, but at least I ain't teetering on bored. A good bit less dusty here. Spices and white pepper have dialed back some. Honey puts on a show. Cocoa and graham are nice. Mouth-feel is a tick citrus-sharp. All told, this Camacho is fairly comparable to a single-speed bicycle. A Schwinn, but not a vintage one like mines. Burn has been near dead even for a time now. Ash is unchanged but builds a bit longer. Profile is still medium and strength is non-nic upping to -medium. Chew is very soft in my lips. Funny: it looks larger than a 50Rg, but feels smaller than that mark. Graham becomes more of a thing, as does citrus. Not a lot to report, truthfully. Wanna see me dance? Hear me sing. Sorry -- I'm doing both, but neither transfer overly well to the written form. I will say that this is the least like a Criollo than just about any other Criollo I have smoked in recent memory. Nice sunny day, brb, gonna bring out my Bonsai. Who said growing a Dwarf Tea Tree was hard? All's ya gotta do is wrap it overnight in a blankie, mist it continuously, and give it plenty of sun during the day. Also, if not done exactly correct -- it'll die in a couple hours time -- no warning. I'm a nervous wreck, gentlepersons... but I'm looking at some buds now. Whew. Meow at the nigh-band, still nada to report upon, amigos. Perhaps there is a tick more harshness on the mouth-feel, nothing terrible. I'm sorta surprised I'm not bored to tears, it's actually a fairly... pleasant smoke. Plus, I have been busying myself, I s'pose. Draw remains even; smoke cool to lukewarm. The best thing this Camacho did was to slow its pace considerably after a very quick opening act. Worst thing it did was to not do much else. 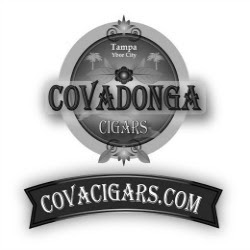 It was nice to smoke a Camacho with rather superior construction. Can't go wrong; unless ya don't go. Pair, gentlepersons, please do. I've been leafing through these Stooges books. Minimal Shemp. Goodnight, Samuel Horwitz... where-ever ya are.